Welcome to the Pretty Faces revolution. There have been all female ski movies in the past, and many of them have been great films. 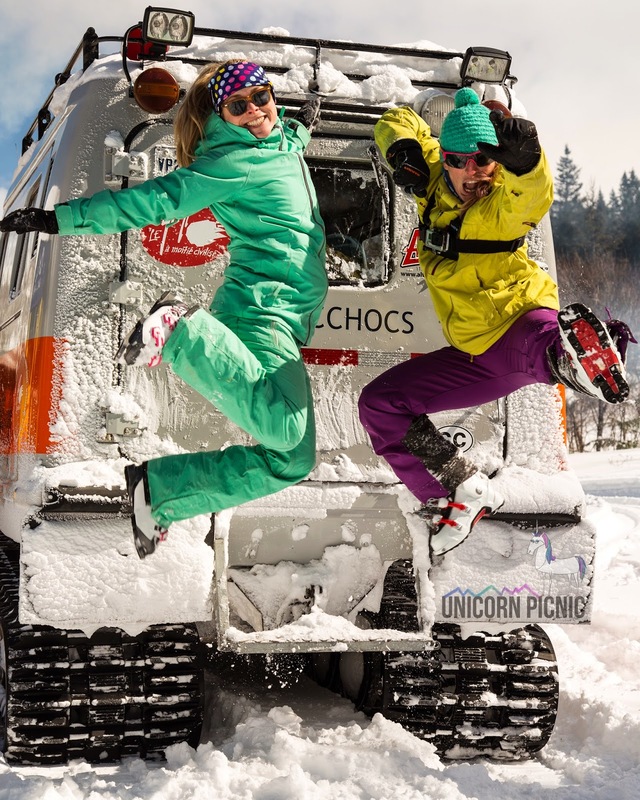 What happened when Pretty Faces, the new Unicorn Picnic Production film came out was more of a paradigm shift than a shred fest. Pretty Faces has been getting a lot of press over the past few weeks and continues to gain momentum as it travels around the country and internationally. If I were to put a finger on why this film has been so well received, I would have to say that it is because of the great skiing, but it is also because of the relatable story it tells. We have all struggled to make it at some point in life, and Pretty Faces is a testament to the fact that if you stick with it for long enough, good things will come. 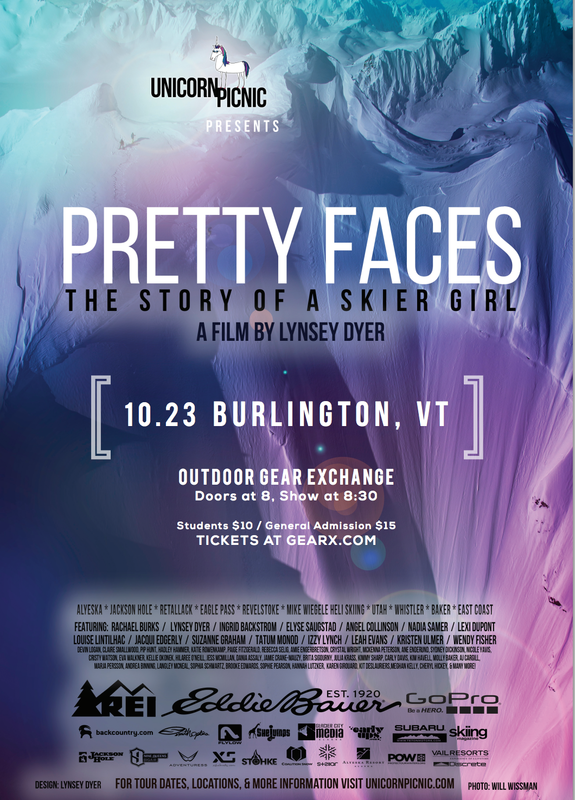 For many of the women in the movie, this meant being able to ski amazing lines in stunning landscapes around the world. For me it meant showing the world that the east coast is not a barren wasteland of skiing, it is a beautiful peaceful, rugged, powdery, good time that deserves far more respect than it often gets. It is my motivation for waking up in the morning because I am always excited to see what the beautiful Vermont landscape has to offer. Moving forward from this movie, I have been thinking about what the next step is for me as a skier. I did not get to ski big Alaskan spines in the film, although I would never pass up the opportunity, but I did get to connect on another level with the landscape I live in. What this movie highlighted for me was that skiing is about crazy adventure, but it is also about finding the root of what makes you happy on a daily basis. For many skiers, it is just understanding how much fun it is to explore your backyard and your local mountains. I am happy when I am outside with the wind in my face, chatting with my friends. I want to go out and challenge myself in the high mountains, but I want to come back and explore the woods filled with old growth maple and birch, eat cider doughnuts, pour maple syrup on everything, and embrace what it is to be a Vermonter. We might not have the biggest mountains, but we have plenty of passion to compensate, and I look forward to watching more movies that focus on the passion of our beloved outdoor sports that speaks to us on a deeper level. The Pretty Faces film was about women doing what they love and doing it well, but it was also about showing the world that being outside is a path to emotional and physical growth and happiness. That was what I took away from this experience and I look forward to more films that bridge that gap between focusing on the aesthetic of skiing and focusing on the underlying character building that happens when you get out and explore. There was a huge amount of work involved in this project and I would not have been able to do it without the help from Mammut, Ski Vermont, Ski The East, DPS, SCOTT Sports, and the Outdoor Gear Exchange. I am looking forward to the East Coast premier at the Outdoor Gear Exchange on October 24th, 2014 with an encore event on October 25th, same time same place.